He went through a lot; he’s definitely a fighter. In the summer of 2015, Tarun Kancharla was an active, happy 9-year-old boy – on vacation with his family in his parent’s home country, India. It was a festive trip, filled with fun, delicious foods, family, and friends. “We were having an excellent time,” remembered his mother, Lavanya. But in late July, Tarun developed a fever. But Lavanya was right to worry. Inside Tarun’s small body lurked Acute Lymphoblastic Leukemia, the most common childhood cancer. No one could see it yet. Over the next month, Tarun’s fever spiked and fell. Lavanya took him to the doctor, then a diagnostic center for blood work, where he fainted. Doctors believed he had a virus. It wasn’t until well after they returned home to Plainville, Mass. – where he was rushed to the hospital, wheezing, with a bump on his chest – that the mystery was solved. On Sept. 14, Tarun’s father, Nagarjunam, took him to Hasbro Children’s Hospital in Providence. Doctors quickly identified leukemia. Lavanya remembers the day clearly. She was worried Tarun was missing school, and she was waiting at the bus stop to pick up his older sister, Pranitha, now 15. 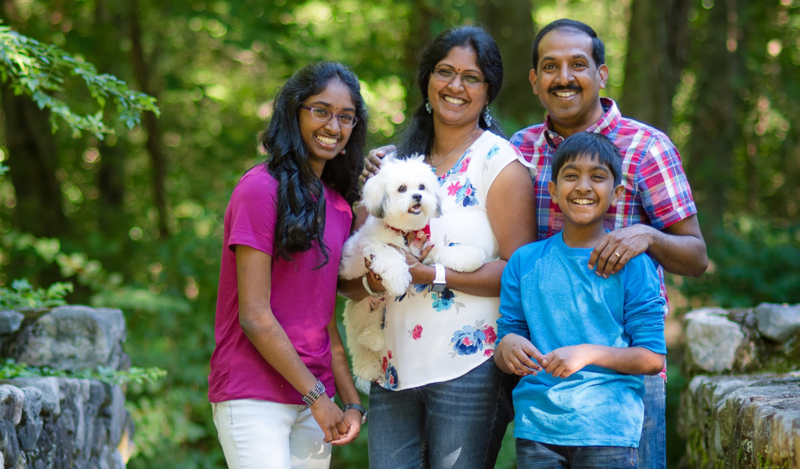 That was the beginning of the Kancharla family’s journey through cancer – a two-year odyssey that started with a month-long hospital stay and intense chemotherapy. His first bone marrow test showed Tarun had cancer in 74 percent of his marrow cells. It was multiplying fast. But it was not yet in his bloodstream and his organs were healthy. First, all Tarun’s white blood cells had to be destroyed. Then, the new cells were monitored. Chemotherapy would continue in three-week cycles, at varying levels, until fall of 2017. His parents did not tell Tarun he had cancer. “We just told him there are some bad things in your blood,” Lavanya said. The treatment was brutal. Tarun developed blisters in his mouth and elsewhere, and was sometimes too weak to walk. He had to have a daily shot through a port in his stomach, which he dreaded. But when his father told him the shot took only a few minutes, he calmed down. Tarun’s father stayed at the hospital for his entire treatment; a database manager, he already worked from home and was able to work from his son’s bedside. Lavanya, a homemaker, took care of Pranitha and brought food to her husband and son every day. The family follows a very specific, almost vegan, diet; healthy homemade food is a foundation of their life. Tarun would not eat the hospital food, she said, laughing. “He said, ‘no, my mom will cook for me.’” And so, she brought him fresh yogurt, carrot juice, and lentils. Today, Tarun is cancer-free. He returned to school in fall of 2016, after homeschooling for a year with regular tutoring from his dedicated math teacher, Mr. Teixeira. Hasbro social worker Stephanie J. Freeman was also extremely helpful transitioning Tarun back to school, talking with staff and classmates about how to support him, Lavanya said. He is now a healthy fifth grader, singing in his school chorus. He also studies Indian classical music, and even composes his own songs. And he has a puppy, Romeo. 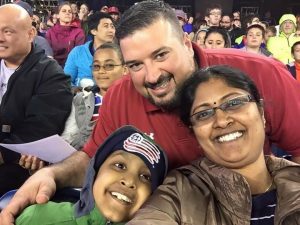 In May 2016, Tarun attended a Revolutions game with his family, courtesy of the Joe Andruzzi Foundation. It was the first time they visited Gillette Stadium, his mom said. “It was really fun.” The family also received a $500 grant, helping cover expenses during Tarun’s treatment. Recently, he told her, “I know for a fact that God is there.” Lavanya was surprised; the family is not particularly religious. She asked him, how do you know? His answer brought her to tears.